Last week, Erin Jessee gave us a list of critical questions to ask to mitigate risk in oral history fieldwork. Today, we’ve invited Jessee back to the blog to talk more in-depth about her recently published article, “Managing Danger in Oral Historical Fieldwork,” spotting signs of trauma during interviews, and dealing with the sensitive nature of oral history. You note that discussion of dangerous or distressing research encounters are common in “corridor talks” among oral historians, yet rarely make it into the scholarly literature. What kind of feedback or reactions have you had from colleagues as you make these conversations more public? Since the article went online, I’ve had a handful of emails thanking me for taking the time to write it, as it’s helping oral historians think through the dangers they’ve faced in past projects, and begin assessing potential future dangers. I also presented a few key points from the article at the Oral History Association meeting in Minneapolis, and the responses were entirely positive and supportive of the idea that—particularly given the recent deregulation of oral history in the United States—we can and should be doing more to assess danger in our work. Most oral historians seem to at least recognize the need to be more open about the potential for danger or emotional distress resulting either directly from the difficult narratives to which they’re exposed or from the personal wounds that these narratives reopen. The few resistant individuals tend to come from other fields, and object on the grounds that it wrongly detracts attention away from our participants. I understand this concern, but I think we need to find a balance between acknowledging the potentially negative impact our research can have on our mental and physical health—ideally, to create an environment that offers practitioners who are struggling more support—while still privileging participants’ narratives. How can oral historians do a better job of spotting signs of trauma in each other, and responding positively? This is important, because I get the impression that many oral historians feel embarrassed or ashamed to admit when their physical and mental health has been negatively impacted by their research. Many of us are navigating heavy workloads, and it doesn’t seem practical to suggest that we all undertake formal training in counselling. Likewise, we may not all be in positions where we’re able or willing to take on the often-unpaid emotional labor that is demanded of us in helping our colleagues process personal or work-related crises, particularly when it extends beyond a momentary bad mood or emergency. But there are things we can do in our professional lives that can make it easier for us to support our colleagues when they’re in distress or minimize the potential for that distress to occur in the first place. For example, Beth Hudnall Stamm’s tips for self-care are helpful for resilience-planning in advance of fieldwork but also include small acts that people can incorporate into their everyday lives. Over time they can help to make them not only more aware of the sources of stress and harm they navigate in their work, research, and personal lives, but also make us more supportive and empathetic colleagues and coworkers. Because of the sensitive nature of your work, some of the life histories you record must ultimately be destroyed. Have you had any difficulty navigating that reality with narrators who want to have their full story told, or institutions and scholars that want access to the primary data? Because I’ve incorporated a very thorough informed consent process throughout my fieldwork, and most of the people I’ve interviewed are intimately familiar with the potential risks they face in participating in the research project, I haven’t encountered any resistance from participants to destroying the interviews we’ve conducted in the past. I should note, however, that the destruction of these interviews was a requirement of the ethics committee at the university where I conducted my doctoral studies, the underlying research design for which underwent review in 2007. I haven’t heard of any researchers in recent years being required to destroy their fieldwork data. Indeed, current best practices seem to allow for the anonymization of any materials that contain personally identifying information, and limited archiving—usually closed to the public and future researchers unless permission is given by the original researcher and/or participants. That said, with the push to demonstrate positive public impact in academic research, I have noticed some tensions between researchers, and university administration and funding agencies. 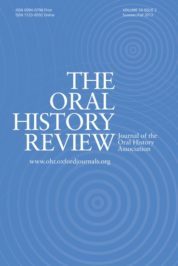 In the UK, universities often maintain online repositories in which oral historians are expected to deposit their interviews, as well as associated publications, to comply with open access requirements. Funding agencies can, as a starting point, require researchers to make use of these repositories as a condition for applying for funding. The tensions emerge around researchers’ concerns that while these repositories include options for closing sensitive materials to the public, they’re still held online and, as such, are hackable. Researchers’ efforts to remove any personally identifying information prior to depositing data in these repositories doesn’t eliminate the possibility of someone’s face or voice being recognized in the event these materials do find their way into the outside world. As such, researchers who are conducting research on potentially sensitive subject matter often feel they are inappropriate for archiving their data, particularly for older projects in which these online repositories were not discussed as a potential means of archiving or dissemination for the interviews entrusted to us. Is there anything you couldn’t address in the article that you’d like to share here? The US Oral History Association (OHA) has formed a Task Force charged with revisiting the organization’s Principles and Best Practices in light of deregulation and the increasingly authoritarian political climate in the US. The Task Force will be presenting the revised best practices for discussion at the OHA meeting in Montréal in October 2018. Meanwhile, in the UK, the Oral History Society and the Oral History Network of Ireland are organizing what will undoubtedly be an important conference in June 2018 on Dangerous Oral Histories: Risks, Responsibilities, and Rewards. This means there will be lots of opportunities for oral historians to publically discuss the challenges they face in their research, as well as strategies for more effectively anticipating and managing danger, regardless of where and with whom they are conducting interviews. What self-care strategies do you utilize? Chime into the discussion in the comments below or on Twitter, Facebook, Tumblr, or Google+. Featured image credit: “Exhaustion” by Jessica Cross. CC BY 2.0 via Flickr. Erin Jessee is a Lord Kelvin Adam Smith Research Fellow in Armed Conflict and Trauma (Modern History) at the University of Glasgow, and a research associate with the Scottish Oral History Centre at the University of Strathclyde. I would be interested to learn of anyone’s “secondary trauma” experiences specifically and of course as comfortable sharing. Political, medical, or other non psychological dangers are probably easier for most of us to imagine. Thanks.